COMTEK /VOS is an SNMP agent which provides Stratus performance and resource utilization information to any SNMP enabled network management system or NMS. COMTEK /VOS can be used for both day-to-day proactive system management and for long-term capacity planning. COMTEK /VOS is designed to monitor the important aspects of the VOS server such as how busy it is, how full the disks are, what processes are running, etc., and report this information to the NMS or Network Manager when requested. In addition, COMTEK /VOS will send alerts (called snmp traps) to the NMS when something goes wrong or when some condition needs fixing. These alerts include Disk Nearly Full, CPU Overloaded, Process Stopped, and many others. COMTEK /VOS was designed to be extremely powerful and at the same time have almost no impact on server performance. It has a very small operational footprint, is non-prorietary, and dependable. COMTEK /VOS is monitoring Stratus servers for many enterprises worldwide. COMTEK /VOS has been in use since 1996 (then called NMServer). COMTEK monitoring solutions have been available on other platforms since 1998. 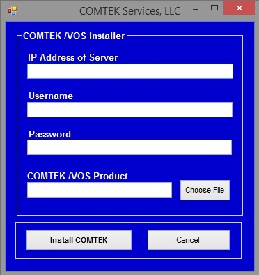 COMTEK /VOS now includes a NEW installer application the moves COMTEK /VOS to the Stratus very quickly. All of the necessary .pm files and configuration files are included in a NEW bundled format which makes file conversion unnessary. When the installer has finished, just unbundle to the system>snmp directory and you are ready to begin testing. In SNMP terminology, the information gathered and maintained by an SNMP agent is represented in a Management Information Base or MIB. The MIB for COMTEK /VOS is tailor-made for VOS by COMTEK, not adapted from some other operating system. 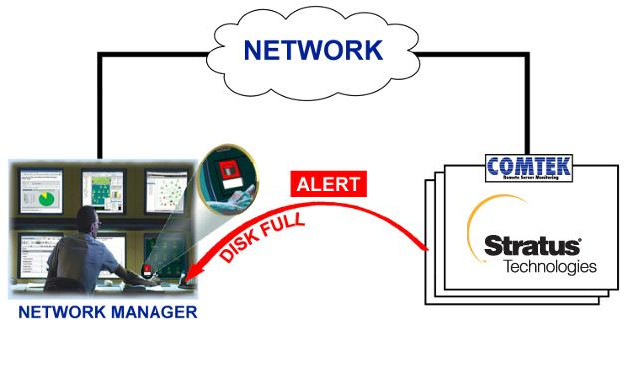 What alerts (SNMP traps) does COMTEK /VOS provide? As a proactive system management tool, COMTEK /VOS provides a variety of trap types. Traps are issued by COMTEK /VOS when system conditions exceed thresholds or conditions that have been set by the end user. COMTEK /VOS has the ability to send user data as SNMP traps. COMTEK /VOS reads user data, places the data into an SNMP trap message and sends it to the NMS. While operating modern sophisticated systems, it is often difficult to notice and resolve all system and application events as they occur. The monitor log feature of COMTEK /VOS allows you to identify critical log messages and forward that information to the NMS as an alert (SNMP trap) so corrective action can be taken before users are impacted. Will COMTEK /VOS work with my TCP/IP stack? COMTEK /VOS is compatible with STREAMS TCP/IP. An earlier version of COMTEK /VOS is available for use with older OS/TCP servers. How would I use COMTEK /VOS? SNMP Network Management is composed of two major pieces - an Agent (such as COMTEK /VOS) running in each element that you wish to monitor and a Network Manager or NMS. Your organization may be using an NMS to monitor its local or wide area network presently. If so, COMTEK /VOS would allow this same system to monitor and manage your VOS servers. Similarly, if you are implementing a new Network Management system, you may wish to include your local or remote VOS servers. What is the Remote Console feature? COMTEK /VOS includes a remote command entry feature which can be used to send VOS commands from the SNMP manager to the COMTEK /VOS agent. The agent processes the VOS command and returns any results to the manager. This feature may be easily disabled when there are concerns about security. What is included with COMTEK /VOS? Installing COMTEK /VOS is simple and safe. Complete installation instructions may be found in the COMTEK /VOS Installation Guide. COMTEK /VOS is a complete package - it includes the SNMP Agent, MIB, Installation Aids, Documentation and Support. There are no additional components to purchase. Click here to request a Price Quote for this product.